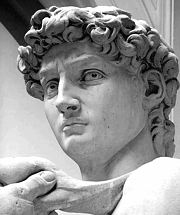 Suppose the Vestry Board of the Cathedral of Florence had come to Michelangelo in 1501 saying, “We have decided the sculpture of David should look like this,” handed him some sketches, bid him ‘buon giorno’ and went out to dinner together. The problem: paper isn’t marble. Paper is flat, marble isn’t. A sketch can suggest what a sculpture might look like, from one angle. But a sketch isn’t a sculpture. A sketch can’t even become a sculpture, unless you turn it into paper-mache. No matter how well-thought-out the sketches may be, the artist has to create the sculpture from scratch every time. Clients don’t always understand this. Some may schedule two months for management to discuss the website, and one week for designers and developers to create the website. As if making a website is just an afterthought when making a website. They talk as though the website is basically done once the developers receive the mockup or the copy. But at that point the website doesn’t yet exist. Some may expect the developers to start work before the client decides what images, words or even what purpose the website will have. Sometimes developers receive the content so close to the deadline, they are forced to start making the website without it. Some honestly don’t see web developers as part of the communications process. Web designers are mere decorators, web developers mere programmers. So they haven’t been included in the discussion about target audience and goals. The problem is that, every moment, web developers must visualize their target audience and make decisions on the best way to reach the site goals. If sculptors make sculptures, it’s even more true that web developers make websites. My point is even more true of web design than it is of print design. A print designer is not just a technician, but you can treat him or her like one: “Here are two images. Combine them in Photoshop. Buon giorno.” You wouldn’t do that to your designer, but you could. And it might work, especially if your designer is as brilliant as Michelangelo and feeling equanimous that day. But you can’t do that to a web designer, and I’m not being persnickety. Here are three reasons why it literally wouldn’t work. We’re not Michelangelo. We’re flattered by your confidence in us, but we don’t know how to do everything. Web design requires imagination and problem-solving skills, but its tools are still limited. Screen sizes are not set in stone. Next year’s phones will have more pixels or a different shape. Last year’s phones may have fewer pixels. With dozens of common screen sizes in use, it no longer means much to to create a pixel-perfect imitation of a PSD on the Web. Which arrangement of pixels do you mean? Craftsmen must work within limitations. Even conference speakers and authors of web design books may not know how to do what you have dreamed up – it may not yet be possible on current browsers. Michelangelo had limitations too – he had to work with a block of stone that two sculptors before him had already gouged and carved on. And it took him three years. Hi Michael. Absolutely, bravo, cheers, amen, OMG yes, haha, on point, as usual. Websites are where all of the arts and sciences go to collide. The future is here, largely unacknowledged, and poorly distributed, but I love to see that fightin’ Texas Aggie web communicators/designers/developers really do have a clue. Here’s a toast to an increasing willingness to engage and connect across disciplines with humility and respect, grace, and, some love.